The Vikings played a significant role in history, spreading their culture and influencing the lands that they raided. The Viking accessories here include a wide range of historical items inspired by these fierce warriors and their mythology. 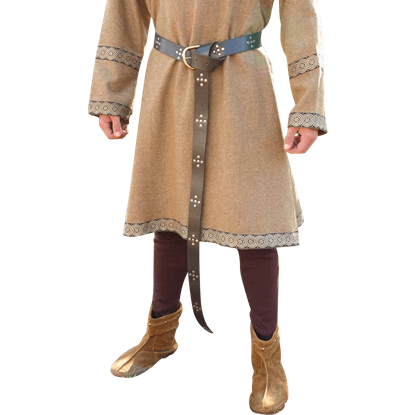 We offer a number of options for the Renaissance fair, including camping tents and supplies, leather belt pouches, and Viking belts, among others. 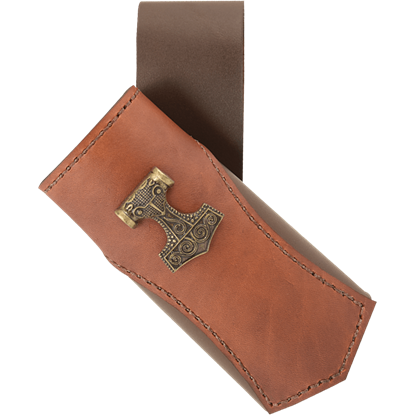 Many of these Norse accessories work well for historical reenactments, theatrical productions, and costume parties, and virtually all of them can be paired with our other Viking collectibles and apparel. Peruse our selection of Viking costume accessories and other pieces to find the perfect item to bring home. 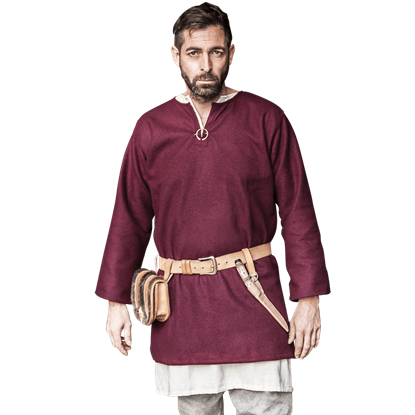 The Beowulf Belt is truly a fantastic belt made of a heavy grade brown leather, which measures a full 74 inches in length. Nickel studs adorn the belt, and it also features a fine brass buckle as decoration. 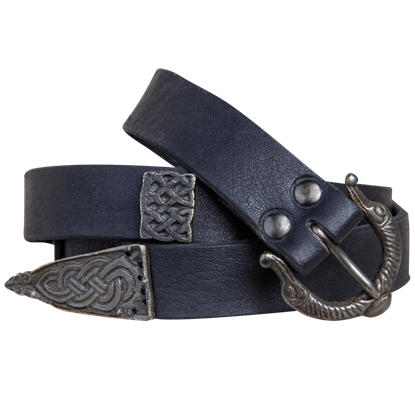 Our Berserker Leather Belt is a mean looking belt, and possibly one of the coolest we have designed. The belt is crafted from 7/8 oz. leather. It is topped off with thinner overlaying straps that brace O-rings along its length. Prepare for the occasional mishap or unfortunate incident guaranteed to occur during a visit to the Neo-Victorian realm. The clever adventurer is never without the right equipment with the Broad Belt to carry steam-powered gadgetry. 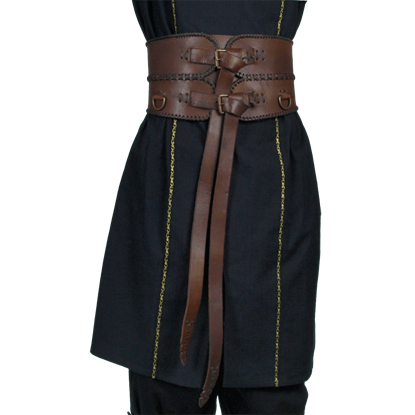 A fantastic period accessory to add to your striking Renaissance fair or historical re-enactment apparel, the Einar Belt is crafted from leather uppers and brass. 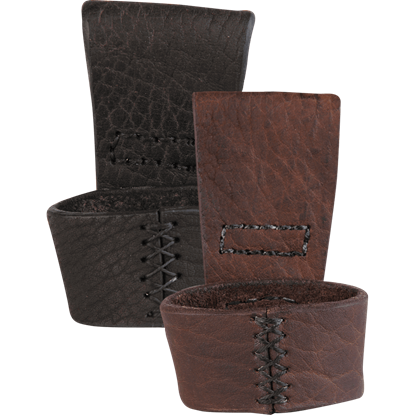 The leather belt was cut from a single piece of thick leather. 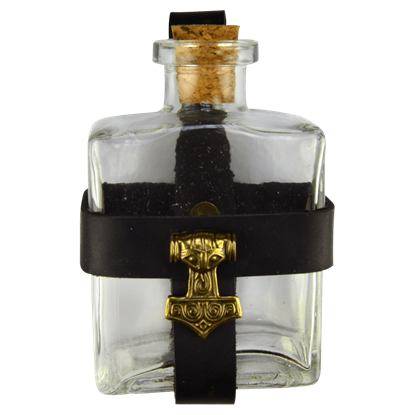 You will be hard pressed to find an accessory as versatile as this Glass Potion Bottle with Mjolnir Holder. The benefit is quite obvious, as it can be used to carry virtually anything, from dry goods to drinkable liquids and more. 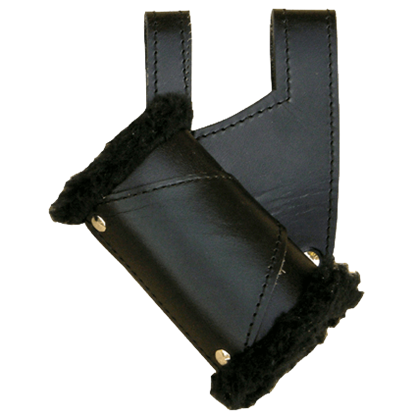 Perfect for wearing with LARP or other re-enactment gear, the Havall Belt features an eye-catching buckle that matches the detailed tip of the strap. 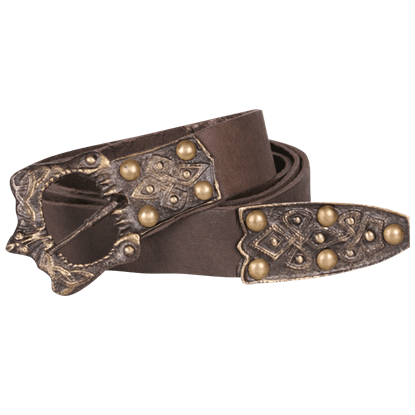 The ornate leather belt is sturdy enough to hold up weapon sheaths or frogs. Jormungandr, The Midgard, or World, Serpent, is a great ouroboros in Norse mythology that encircles the world. The Jormungandr Belt Buckle depicts this massive sea serpent biting its tail as it is described in the Prose Edda. 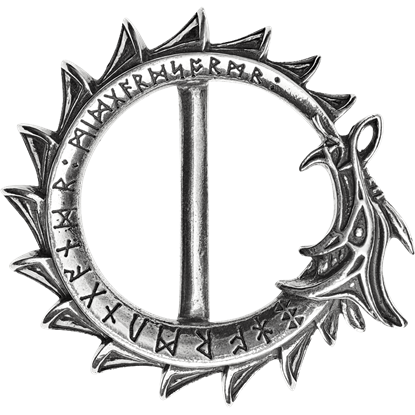 During the Middle Ages, clothes were fastened together with the highly functional penannular brooch, which was most popular among Vikings and Celts. The Large Viking Brooch takes this design and revamps it for the modern age. This is not a typical Medieval Ring belt, but a buckle belt with rings attached along the length that you can hang or clip your accessories to. 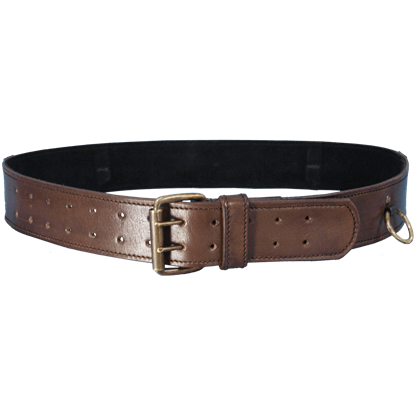 This belt is a great accent to any outfit, for any character, in any period. Strike with the might of a thunder god when you draw your weapon from the Mjolnir Sword Frog. This handmade leather sword frog is ideal for a variety of LARP weapons. The hammer of Thor, Mjolnir, decorates its front accent panel. Just wanted to drop a note! AWESOME STUFF. It just arrived today :) I was pretty worried if things would still get shipped as they were all 'out of stock'. However, I was not let down. This is beautiful stuff! Awesome job and thank you.